Amazon UK is offering a 500GB storm grey Xbox One S with Call of Duty: Infinite Warfare and a sprinkling of DLC extras for £250. You'll also secure a matching storm grey controller, a copy of Call of Duty: Infinite Warfare, zombie pin badges, and the Hellstorm animated personalisation pack which includes an animated weapon camo, animated calling card, and animated reticle. 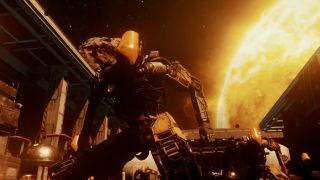 In our Call of Duty: Infinite Warfare review, we said it was: "consistent and exciting, albeit perhaps without any overtly outstanding moments. It's more one big overall pleasing shooty space noise - satisfying throughout, with no massive peaks but, more importantly, no troughs either." For the very latest and greatest Black Friday 2016 deals, keep an eye on our Black Friday mega-article for all the hottest bargains over the next few weeks.